CD review: "The Contemporary Records Story"
Contemporary Records was never a heavyweight jazz label the way, say,Blue Note, Atlantic or Verve were/are. But given the level of talent that recorded for the label, the number of signature albums they released, and the sheer volume of top-notch jazz found here through the years, you'd have to put Contemporary in that mid-major group with Pablo, Riverside and Milestone. A new four-disc retrospective of Contemporary shows what a strong catalogue founder Lester Koenig built from 1952 until his death in 1977. Constructed around the twin pillars of artistic freedom for the musicians and technological excellence for the recording equipment, Koenig's L.A.-based Contemporary label gave jazz musicians the same four-star treatment that Blue Note was providing on the East Coast. Considering the range of musicians who recorded for Koenig through his years of running the label, there's no one style that defines the label's catalog. But just about everything had a looseness to it, a relaxed air of creativity and hipness. From Ornette Coleman's free jazz to Sonny Rollins' signature bop sound, Barney Kessel's luscious guitar to Art Pepper's haunting alto sax, there is a consistent air of sophistication and art to the Contemporary catalog. The production of this box set is as demanding as when Koenig ran the show (Fantasy now owns Contemporary, and continues issuing both previously out-of-print sides and new recordings). The in-depth history by Richard Ginell is touchingly sentimental. Each of the 57 tracks is fully annotated, including album cover art from the original release, and Ginell's history is loaded with photos of the musicians. 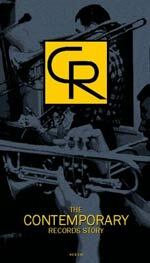 It is a wonderful collection that will be treasured by anyone with a head for jazz history.